Global population will decline from about 2100 onward. That demographic is already written in stone. For some countries the decline has already started. By 2100 the global population will have reached about 10.5 billion. It is already too late for the subsequent decline to be completely averted, but it is the experience of countries such as those above over the next 5 decades or so which will be key in determining how the challenge is to be met. Declining fertility rate is now a global phenomenon but it is the rate at which population declines locally that will be the determining factor if, and to what extent, societal collapse occurs. The more interconnected and interdependent a society is, the more traumatic a collapse will be. In well developed societies (and using Japan as an example) the first stress-point will come with the ratio of those in productive work (16 – 70 years) to those in need of societal support (<16 and >70 years). At some point the cost of this support will become prohibitive for the public purse. The support will not end abruptly but will become increasingly a function of the availability of private resources. Even within the last decade I have observed that public health care in Europe is now trying to reduce the number of hip and knee replacements for the elderly. For patients beyond a certain age, public health care now tries to avoid the more expensive procedures (cancer treatment, complex surgery ….. ). A new measure is now coming into play in decision making for public health care – YPPL (Years of Potential Life Lost). Once a patient is over 80, the YPPL is too low to justify the more expensive procedures. The effects of depopulation would first be felt in rural areas where communities, which once were largely self-sufficient, become under-critical. These effects are already being seen in rural Japan where public transport is reducing, houses, schools and clinics are being abandoned and what little manufacturing industry was present has vanished. Those left in the rural areas are the elderly who have not the wherewithal to move. In central Europe it is the young, and especially young women, who move away from rural areas. Paradoxically, cities could become inundated with populations moving in from rural areas which have become under-critical. The city services would be over-extended but without the labour force to be able to provide increased services. Misery would increase in both rural areas and in the cities. The great mitigating hope is the development of AI and robots. However a fully automated society will also need much infrastructure investment and automation will not be able to stop the abandonment of rural areas. Driver-less buses and robot-manned clinics are entirely feasible but these will be solutions that will need a critical mass of population. Services for children and the elderly will be increasingly automated but will necessarily be concentrated in the cities. I have no doubt that the challenges will be met. I suspect that automation and AI will be of greater value than mass migration. But the transition may take several decades and perhaps even a hundred years. 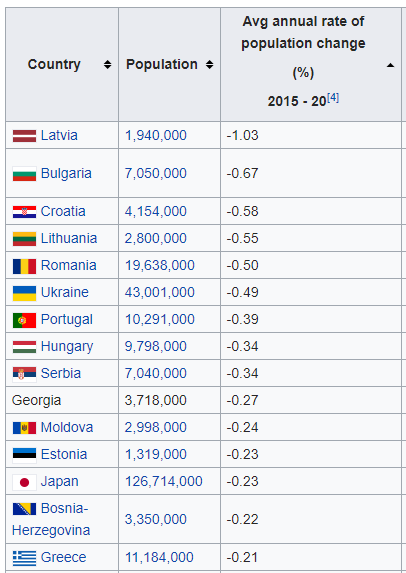 Even though some central European countries are seeing a more rapid population decline, I expect that Japan will lead the way in finding the new solutions. By 2060 the Japanese population will be just two-thirds of what it was in 2010. Forests and farms will have to be automated to a much higher degree. Small, family-run rice production will shift to larger, automated farms. Rural areas will still be productive – but they will be unmanned. Growth will no longer be driven by population growth. The transition to a much more automated society will come, but with a cost. That cost will be an increase in the misery index. The elderly in rural areas will be the first to experience an increase of misery. Longevity increase will level off and may even reverse. Public health care for the elderly will have to meet cost benefit criteria. Voluntary euthanasia for the elderly will become normal. There will be tax incentives for having children. Any need for an increase in children services will be met by automation rather than by humans. The success of automation will reduce the pool of routine, unskilled jobs available. Unemployment for the less-educated and the less-skilled will increase. The social rift between the unemployable and the more intelligent, skilled or creative could increase. The increase of misery seems inevitable. But it will not last for ever. Population will probably stabilise but there will be a strong pressure for ensuring the long-term employability of those being born. A much greater degree of genetic screening of fetuses will result. Downs Syndrome and other genetic conditions will be eliminated. Humans may well be on the way to evolving to be more cerebrally capable and less capable physically. Artificial selection will have arrived. This entry was posted on August 6, 2018 at 9:20 am and is filed under Uncategorized. You can follow any responses to this entry through the RSS 2.0 feed. Both comments and pings are currently closed.